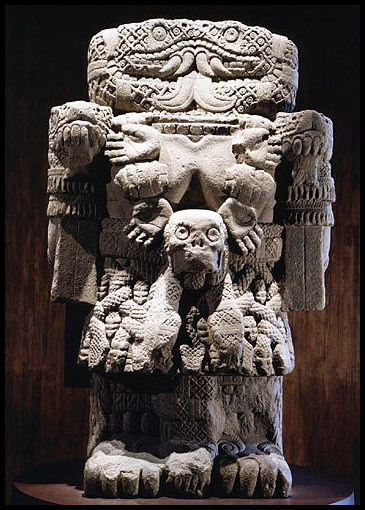 The great statue of Coatlicue was torn down from the great temple of Tenochtitlan where she had reigned as a goddess before the Spanish Conquistadors buried her as a pagan idol. She remained buried until August 13th, 1790, when city workers discovered the colossal statue as they were removing pavement from the Plaza Mayor in Mexico City. They unearthed it and discovered that it was a ten ton sculpture of the Aztec deity Coatlicue which translates to �She of the skirt of serpents.� The colonial mayor arranged for it to be taken to the Royal and Pontifical University of Mexico as a �monument of American antiquity.� The Aztec statue was placed in the university collection of plaster replicas of Greco-Roman works. The professors at the university decided the sculpture should be buried back in the place it was found. The Aztec image not only rekindled the Indigenous Natives memory of their ancient beliefs but artistically its very presence was vulgar compared to the other collections in the cloister. 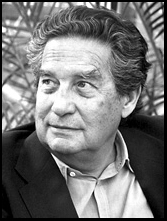 This BrownPride.com feature is inspired and dedicated to Mexican author, poet, diplomat, and Nobel Laureate (Winner of the Nobel Prize in Literature in 1990) Octavio Paz (b. March 31, 1914 � April 19, 1998).